Firefighters remove a dead body that was killed in wildfires in Mati east of Athens, Tuesday, July 24, 2018. Greece observed a period of mourning Wednesday as crews continued checking cars and homes burned in fast-moving fires that have killed at least 81 people. 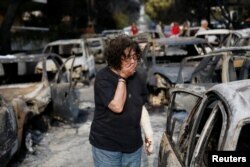 A woman reacts as she tries to find her dog, following a wildfire at the village of Mati, near Athens, Greece. High wind gusts helped the fires spread quickly in hot, dry weather.